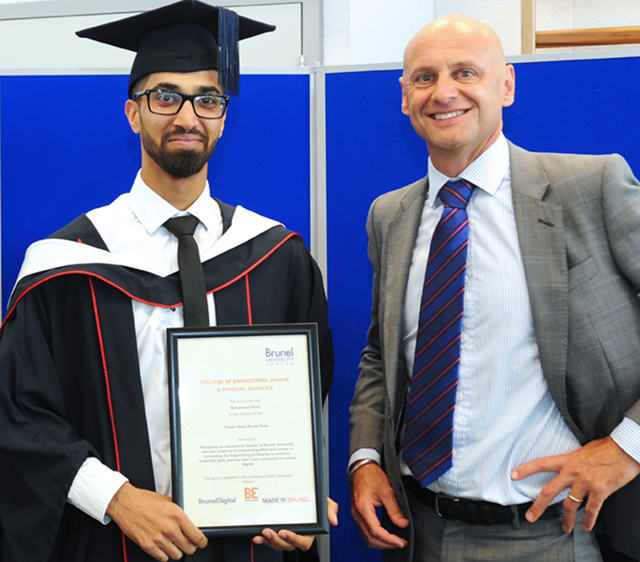 On the 11 July, Business Director Mark Dorn presented the award to the winner of Brunel University's science, technology, engineering and mathematics (STEM) Outreach prize, sponsored by Frazer-Nash. The competition invited Brunel students who had acted as STEM role models to apply, showing how they had inspired, motivated and helped young people to understand STEM subjects. The prize was awarded to Mohammed Khan, who is graduating with a BEng this summer in the Department of Electronics and Computer Engineering. Mohammed submitted a portfolio of commendation showing his work as a STEM ambassador, and included references and recommendations from teachers and professionals. Mark said: "I was delighted to present this well-deserved prize to Mohammed as winner of Brunel University's STEM Outreach Prize. "As a leading systems and engineering consultancy, Frazer-Nash's people make a real difference to our clients in the power, aerospace, transport, and defence sectors, and we're committed to inspiring young people to take up a career in science, technology, engineering or maths related disciplines. In the future, we know that these students, and the young people they have inspired to understand and participate in STEM subjects, will help make a real difference too."